SAO PAULO/BRASILIA (Reuters) - Brazil's former President Michel Temer was arrested on Thursday in "Operation Radioactivity," a probe of alleged graft in the construction of a nuclear power plant, threatening to delay debate over the government's ambitious fiscal reforms. Prosecutors alleged that Temer was the leader of a "criminal organization" that took in 1.8 billion reais ($472 million) in bribes or pending future kickbacks as part of numerous schemes, including one related to the Angra nuclear power plant complex on the Rio de Janeiro coast and other state firms. The former president's Brazil Democratic Movement party long held sway over key appointments in Brazil's largely state-run energy sector, including nuclear power plants. Brazil's currency and the Bovespa stock index both slipped around 1 percent, as the arrest grabbed the attention of Congress just as it was taking up a bill to save some 1 trillion reais in social security spending over a decade. "This could slow down the pension reform process, which is already disappointing," Danilo Gennari, partner at Brasilia-based political consultancy DRG. "Temer's arrest will not help the climate in Congress." 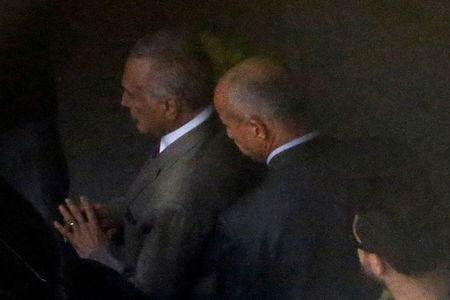 Federal police also arrested Temer's former minister and confidant Wellington Moreira Franco, who is married to the mother-in-law of Rodrigo Maia, the speaker of the lower house of Congress and a leading proponent of pension reform. Asked about the arrest during a trip to Chile, President Jair Bolsonaro said "everyone must respond for their actions" and that Temer's fate was the result of traditional corrupt political practices that he has vowed to end. Brazil's sweeping "Car Wash" probe has uncovered what U.S. prosecutors called the world's largest graft scheme, starting with political bribery involving oil company Petroleo Brasileiro SA and spreading to other sectors and public works. Over 150 powerful politicians and businessmen have been convicted in relation to the investigation since 2014, which has reshaped the country's political and business landscapes. Voters' anger over long-running graft fueled the ascent of Bolsonaro, a far-right politician who served 30 years as a fringe lawmaker, but rose to power on the back of pledges to end graft in Brasilia. Work on Angra 3, the third nuclear power plant planned in Brazil's Angra complex, has advanced haltingly since 1984 and has long been on the radar of graft investigators. The complex is run by Eletronuclear, a unit of state power holding company Centrais Eletricas Brasileiras SA, or Eletrobras. "The criminal group that was arrested today .... has been in operation for more than 40 years," said federal prosecutor Fabiana Schneider. The group included a "counterintelligence" arm that tried to thwart any criminal charges by monitoring investigations and the prosecutors themselves, feeding false documents to authorities to mislead them, the prosecutors said. The son of Lebanese immigrants who arrived in Brazil in 1925, Temer was the youngest of eight children and began his political career in the 1960s as an aide in Sao Paulo state's education secretariat. The governor at the time, Ademar de Barros, one of the first politicians to inspire the popular Brazilian saying about their leaders: "He steals, but he gets things done."